Located on the ground floor of the Infinite Studios building, Revolution Coffee has recently introduced a new menu featuring Asian classics with a twist. The menu changes come with the return of Chef Shen Tan, who came back to helm the kitchen in November 2016 after a hiatus. 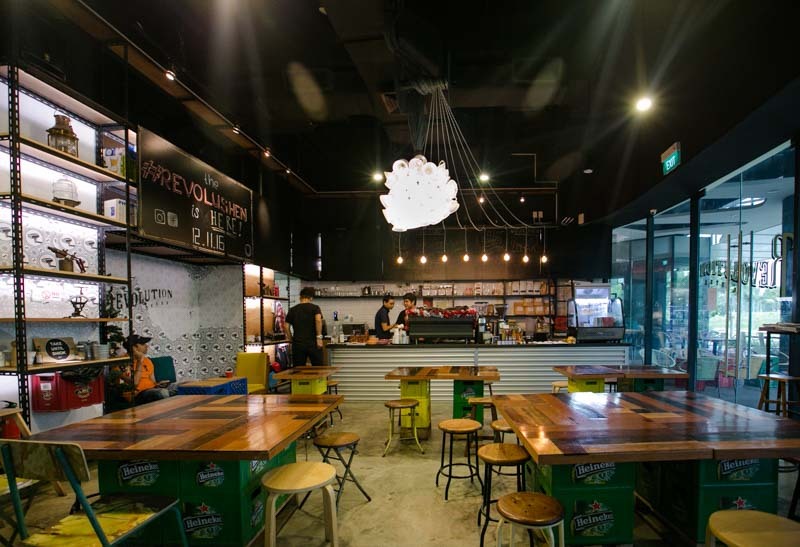 No stranger to Asian cooking, Chef Shen’s first foray into the F&B industry started with Wok and Barrel (now closed), her very own hawker stall known for the dish Madam Tan’s twice steamed Nasi Lemak. 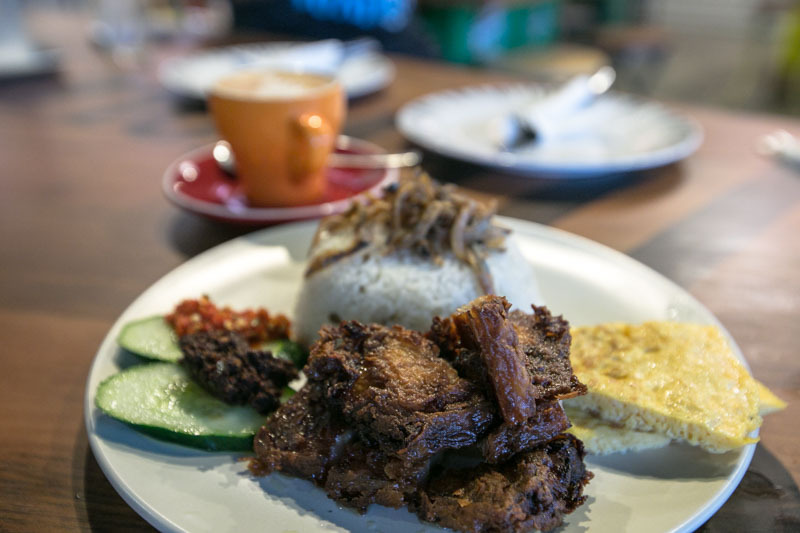 Inspired by her mum, the Nasi Lemak gained quite a following, and lucky for all of us, Chef Shen has included an improved version of the dish in the new menu at Revolution Coffee. Walking into the cafe, we were immediately greeted by the aroma of freshly brewed coffee. 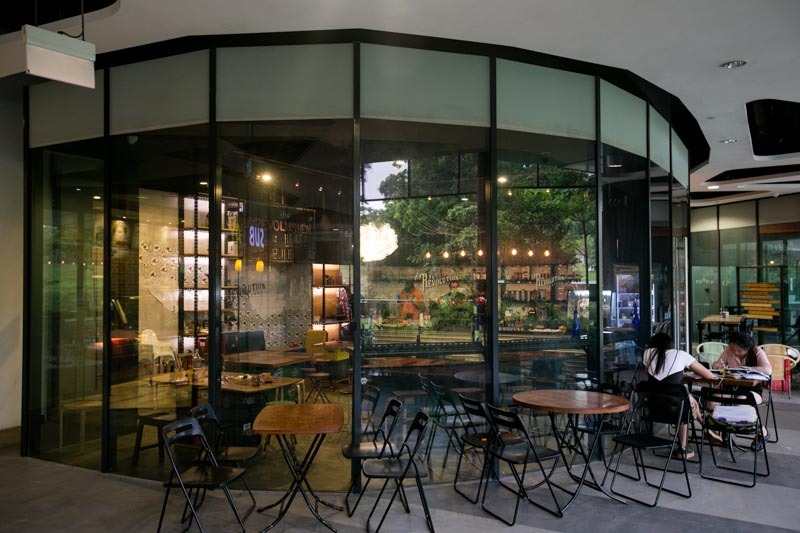 The mishmash of industrial fixtures and old school furniture parallels the cafe’s daring culinary philosophy in reinventing classic Asian dishes. The communal tables in the middle of the cafe provide a vibrant space for big groups to gather and catch up over a nice meal. Just don’t expect a quiet space for a private conversation if you’re coming by during peak hours. 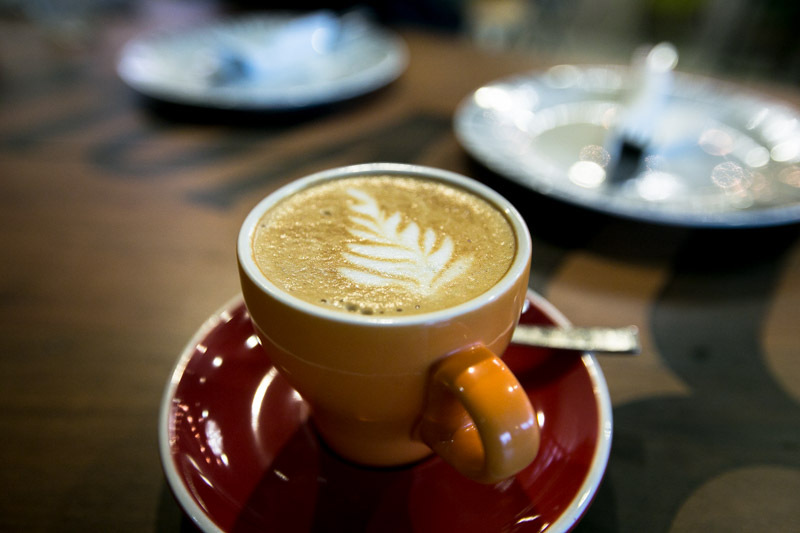 A strong and robust cup of joe is the foundation of any good cafe. To start our meal off, we ordered a Cappuccino ($5.50), which had a slight acidity to it without being too overly bitter. It turns out that the coffee served at Revolution Coffee is roasted by The Caffeine Dispensary, their sister company in Indonesia. Expect to find both imported (Brazil, Ethiopia, El Salvador) and regional (West Java, Bali Kintamani, Sumatra, Flores) bean blends here. For starters, we tried the Grilled Laksa Salad ($9.90), a gluten free option that is also perfect for vegans. 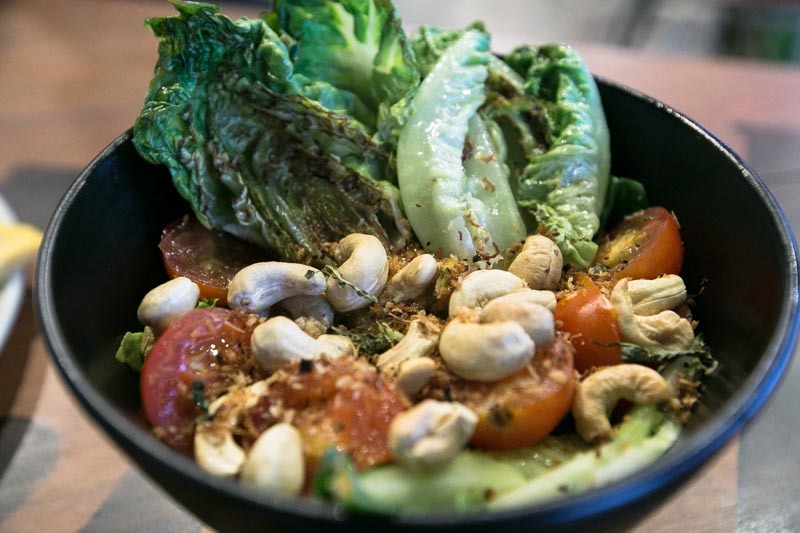 The warm salad consists of grilled baby Romaine lettuce, toasted grated coconut, fried shallots, cherry tomato confit, laksa leaf pesto and toasted cashew nuts dressed in a coconut lime laksa dressing. The salad provided a variety of textures and flavours but do make sure to give it a good toss to combine everything before enjoying! We obviously had to order the famous Nasi Lemak, and as mentioned, Chef Shen has improved the recipe that now features ten different ingredients including fried ikan billis, omelette, cucumber slices, homemade sambal belachan and coffee sambal. Each spoonful of fluffy, aromatic coconut rice paired perfectly with the fragrant belachan and coffee sambal, which was unconventional but very fitting for the dish, even with the strong coffee flavour. You can choose from a variety of meats to accompany your Nasi Lemak. We had the Nasi Lemak Crispy Pork ($7.90) featuring marinated pork belly slices that have been fried to a crispy dark brown. The best thing about it was that the pork belly slices remained tender and juicy even after frying. 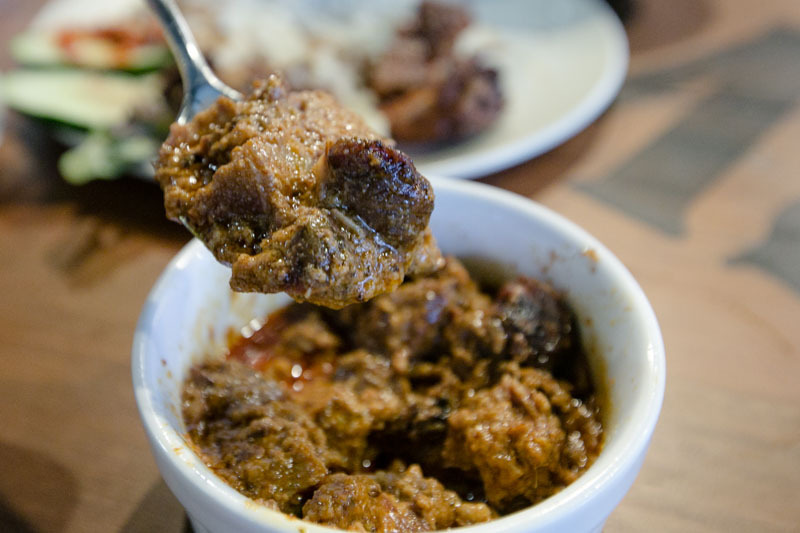 As an alternative, try pairing your Nasi Lemak with the Beef or Chicken Rendang ($9.90). Aromatic and flavourful, the beef we had was cooked sous-vide in the sauce made from rempah (spice-paste), and was extremely tender. 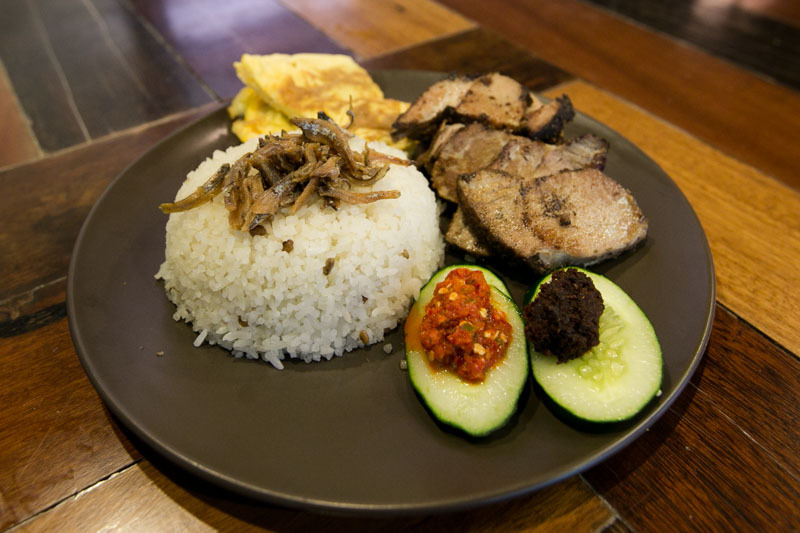 We just couldn’t resist but to also try the Nasi Lemak with 5 Spice Pork Confit ($9.90). A dry rub containing a combination of spices, discharged coffee grounds and brown sugar is used to marinate the pork, before it is slow cooked for 24 hours. The result is pork slices that are extremely tender and flavourful. We could really taste the distinct flavour of the spices used, as well the slight bitter taste of the coffee grounds. 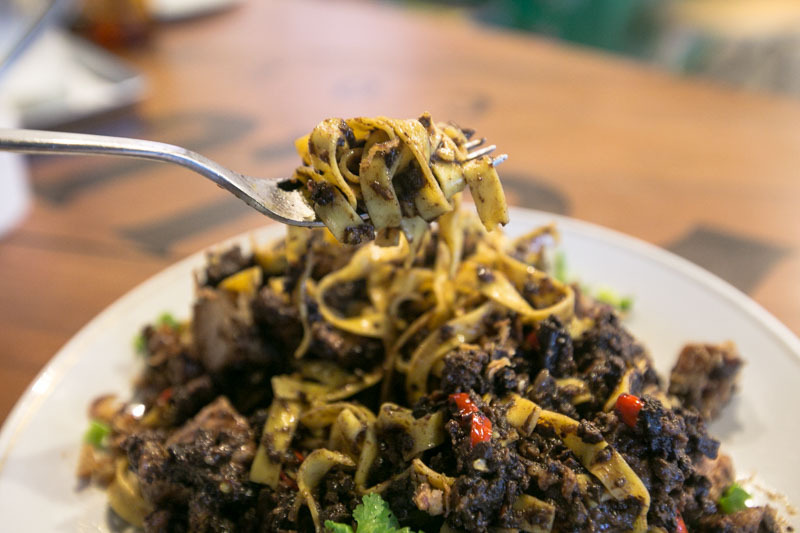 While buah keluak remains an ingredient that is primarily used in Peranakan cooking, Chef Shen has taken a bold approach by turning it into a pasta dish. Don’t be put off by the colour of the Buah Keluak Pasta ($19.90) and dive straight in for a quick mix and bite. The tagliatelle pasta was cooked al dente and went really well with the homemade buah keluak sauce. The dry combination of the spices and ingredients (twice cooked pork belly, minced prawns, minced pork, chilli padi, lard bits) were carefully selected to contribute unique flavours to the final dish. Moving on from the main courses, we finally arrived at (what we thought was) the best part of the meal – Desserts. 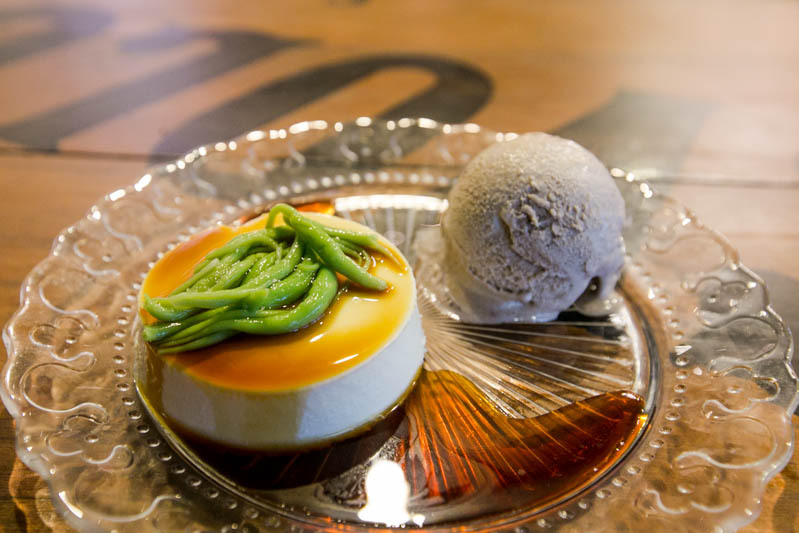 Not shying away from Asian flavours, Chef Shen’s approach to desserts is also unconventional. The Shendol Delights ($10) is a must try! A conventional panna cotta is given an Asian twist, by using coconut cream instead. Using gula melaka syrup and homemade red bean ice cream for the sweetness and creaminess, it felt almost as good as having a cendol at a hawker centre. 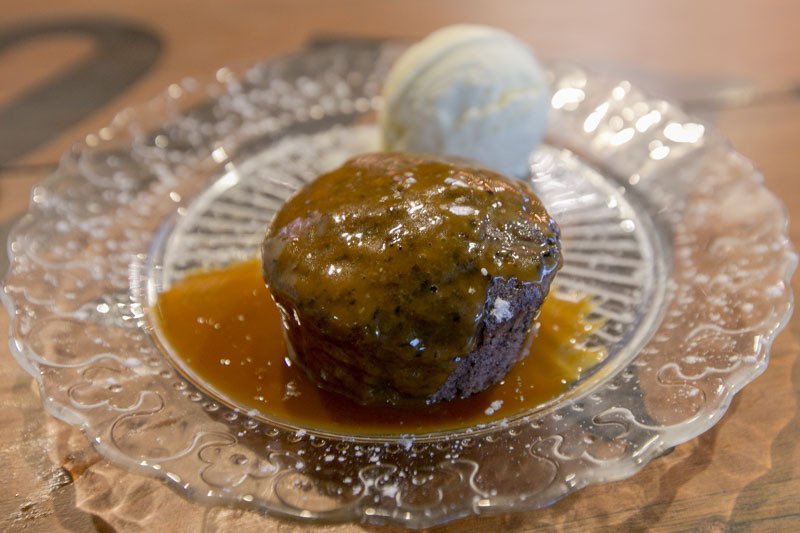 Yet another twist to the popular sticky date pudding resulted in what Chef Shen calls the Pulot Hitam Pudding ($10). The sponge cake is made using black glutinous rice (pulot hitam), drizzled with a gula melaka (palm sugar) butterscotch sauce and served with homemade coconut ice cream. I loved the interpretation of this traditional dessert but would admittedly still prefer a bowl of hot piping pulot hitam with coconut cream, where the taste and texture of the dessert is more appealing. We’re glad that accomplished chefs like Chef Shen are constantly looking to improve their recipes and are not simply resting on their laurels. While the new menu here spots a heavy influence of Asian flavours, the regular brunch classics are available as well. 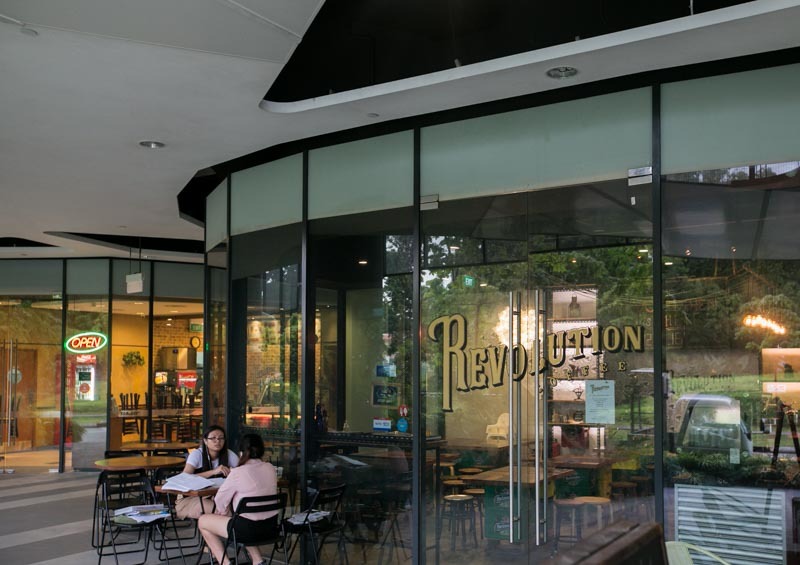 Do look out for more interesting dishes coming soon from Revolution Coffee, such as Kueh Dada Mille Crepe Cake and Kaya Bread and Butter Pudding.